Landon Powell is starting his fifth season as the head coach of North Greenville University baseball. During his four seasons in Tigerville, the former Major League Baseball player and University of South Carolina standout has amassed a record of 148-66 (.692), including two Conference Carolinas tournament championships, one regular season conference championship, and two southeast regional appearances. In the 2018 season, the Crusaders were ranked #1 nationally in Division II. Upon Powell's hiring in the summer of 2014, he inherited a program that was coming off an 8-35 record in the 2014 season, and was projected to finish last in the Conference Carolinas to begin his tenure in 2015. However, Coach Powell's impact was immediately felt as the Crusaders improved by 22 wins and would go on to win the Conference Carolinas Tournament for the first time in program history, securing its first trip to the NCAA Division II baseball regional tournament. The program saw more improvement in the 2016 season with 35 wins, a .307 team AVG, and a 3.26 team ERA. A 16-inning thriller that resulted in a 5-4 NGU victory over Mount Olive was the highlight of the season. For the 2017 season, the Crusaders set the bar even higher with 38 wins and a program-best 21-1 record at home. Starting pitcher Tucker Burgess went on to make the Southeast All-Region Second Team. In 2018, the Crusasders made a historical run with 46 wins including 21 conference victories. NGU dominated the Conference Carolinas Tournament and entered the Southeast Regional as the #1 seed. Connor Grant and Tucker Burgess made the Southeast All-Region First Team. One of the other glaring differences in the NGU program since Powell's arrival is that players are consistently being drafted and signed to play professionally. Since 2015, ten players have signed professional contracts: Allen Staton - St. Louis Cardinals - 2015, Adam Boghosian - Washington Nationals - 2015, Ryne Frankoff - Philadelphia Phillies - 2015, Hunter Dilworth - Independent - 2016, Clark Scolamiero - Cleveland Indians - 2017, Nathaniel Maggio - Independent - 2017, Zak Kamerman - Independent - 2017, Andrew Frazier - Independent - 2017, Connor Grant - Miami Marlins - 2018, John Jones - Oakland Athletics - 2018. Powell, a native of Apex, North Carolina, was rated the second best high school baseball player in the draft by Baseball America coming out of high school. However, Powell chose to forgo the draft and enrolled at the University of South Carolina where he played four seasons of collegiate baseball. Powell was one of the leading offensive threats for the Gamecocks, finishing with a career batting average of .306 as a switch-hitting catcher, with 44 homeruns, 61 doubles, and 193 RBI. The two-time team captain also earned multiple All-American nods, including his senior season when he was given five All-American nods, as well as an All-South Eastern Conference honor. He graduated with a Bachelor of Science degree from the University of South Carolina 2006 and recently completed his Masters in Education from North Greenville University in 2017. The former College World Series All-Tournament team honoree and member of the CWS all-time legends team holds school records for a catcher in career putouts (1,768) and assists (190), and ranked third all-time in Gamecock history in games played (251), including 242 as a catcher. He also ranks second all-time in doubles (61), is tied for third in at bats (866), and stands fourth in both hits (265) and total bases (468), and fifth in home runs (44). In 2014, Powell was added to the University of South Carolina Hall of Fame. 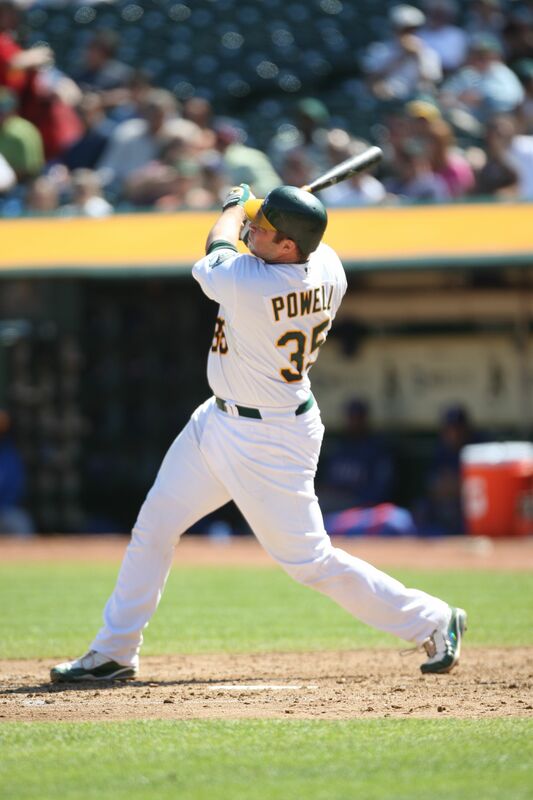 Landon Powell was drafted in the first round, 24th overall in the 2004 Major League Baseball draft by the Athletics of Oakland California. In his major league career, Powell hit 13 homeruns, 59 RBI, and was known as one of the better defensive catchers in Major Leauge Baseball. One of Powell’s career baseball highlights came in May of 2010, where he caught Dallas Braden’s perfect game for the Athletics. Powell also had brief stints with the Houston Astros in 2012, and the New York Mets in 2013. Powell retired from playing baseball after the 2013 season and landed his first coaching gig at Furman University, just down the road from North Greenville. His responsibilities at Furman included coaching hitters, catchers, and was also the interim pitching coach. Powell and his wife Allyson reside in Greenville, and have two children Holden and Ellie. The Powell’s other daughter, Izzy, passed away in 2013 from a rare autoimmune disease. That journey was chronicled by ESPN E60 in a documentary called "The Backup Catcher." The family started a charity event called Donors on the Diamond, in honor of their late daughter. Powell also is on the board of directors for Donate for Life, an organization which helps promote organ, eye, and tissue donation.